Hibiscuses are perennial plants and deciduous shrubs that grow best in frost-free, temperate climates. 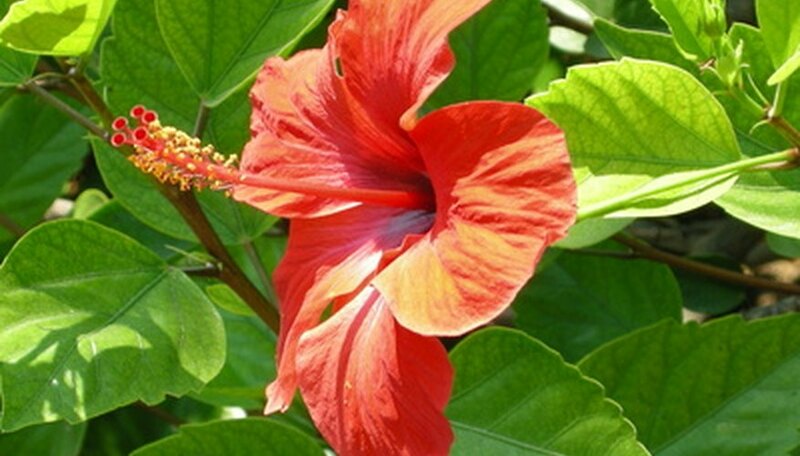 The hibiscus is known for its huge, showy and brightly colored blooms that lend a tropical look to landscapes. The flowers are trumpet-shaped, up to 6 inches in diameter; they can bloom from late spring through autumn. The hibiscus can reach a height of up to 15 feet in regions that don’t experience frosts. The most important part of planting hibiscuses outdoors is choosing the best location for the plants. Hibiscuses have specific requirements when it comes to their ideal planting site. Choose a planting location for your hibiscus that receives full, direct sunlight and has well-draining soil. If you’re growing tall hibiscus plants, select a site that has some protection from high winds to prevent stem breakage. Plant your hibiscus outdoors anytime from spring until fall. Dig a planting hole that’s the same depth as--and twice the width of--the hibiscus’s root ball. Mix into the displace soil some organic compost, so that you have no more than one part compost to four parts native soil. Remove the hibiscus from the nursery container. Place the root ball into the planting hole, ensuring that the top of the root ball is level with the surrounding ground surface and not deeper. Fill the planting hole with the displaced, amended soil about halfway. Water the soil in the planting hole to eliminate any air pockets from around the roots, providing 1/2 to 1 gallon of water. Fill the planting hole the rest of the way and water the soil thoroughly down to the root ball, providing 1 gallon of water. Water your hibiscus deeply and thoroughly once each week when rainfall is less than 1 inch, as hibiscuses require 1 to 1 1/2 inches of water per week in order to thrive. Water the hibiscus from spring through fall. The soil should be kept evenly and constantly moist, but it shouldn't be left soggy. Fertilize your hibiscus once every two weeks while the shrub is actively growing with an all-purpose fertilizer made for flowering shrubs. Follow the application and dosage directions on the fertilizer label. Avoid planting the hibiscus outdoors if you live in a region that experiences winter temperatures below 30 degrees Fahrenheit. Instead, plant the hibiscus in a container; bring it indoors during the colder fall and winter months. How Fast Does a Hibiscus Bush Grow?